This is a card for "The Wright Club" this month. I used only Whisper White cardstock and Regal Rose for my two colors. The stamp set is Simple Friendship, and I have a butterfly thing going on, and this is my favorite butterfly right now! 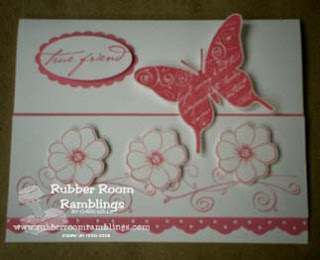 I used lots of dimensionals on this card to pop up the flowers the sentiment and the butterfly. The punches are the Wide Oval Scallop, Large Oval and Eyelet Lace Border.